Kirk Montgomery usually reads the headlines as a TV anchor. Today, he’s making headlines after paying $500 for a 1968 Landola single wide and transforming it with his own version of an affordable mobile home remodel. The Michigan native recently moved back to his home state to launch and anchor a 4pm newscast and needed to find a new place to live. Being a TV anchor, Kirk was familiar with the current trend of small homes and debt-free living. He was intrigued with the flexibility that a smaller home could give him, and naturally, the smaller price tag was enticing. Kirk began his search for a new home and quickly stumbled upon an ad for a 1968 Landola single wide at an incredibly low price of $499.99. With an open mind, he contacted the sellers and found the home to be in fairly decent shape considering it had set completely empty for 7 years. The home had just enough space and was located in a nice park with affordable lot rent. It had potential and that’s all a vintage mobile home needs when the right person gets ahold of it! Kirk was ready for a new adventure, but was he able to handle a complete mobile home remodeling project? Could the structure really be transformed with an affordable mobile home remodel? The answer to both questions is a resounding yes! After a contractor’s inspection, Kirk bought the vintage mobile home. 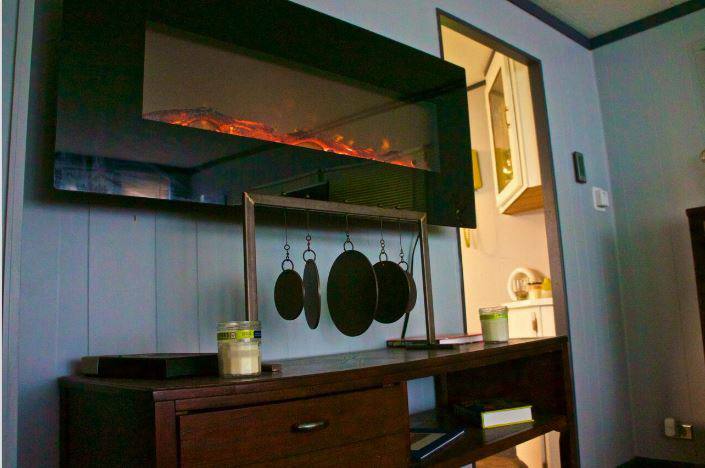 The result of his affordable mobile home remodel is absolutely amazing! Since starting his affordable mobile home remodel, Kirk Montgomery has learned to deal with the friendly, yet vaguely negative, comments made by well-meaning friends. My friends think I’m nuts! “How can you live in something so small,” they ask? I just remind them that this is bigger than the studio apartment I rented for $1500.00 a month while working in Denver, CO! To the unfamiliar, mobile homes still conjure negative opinions. 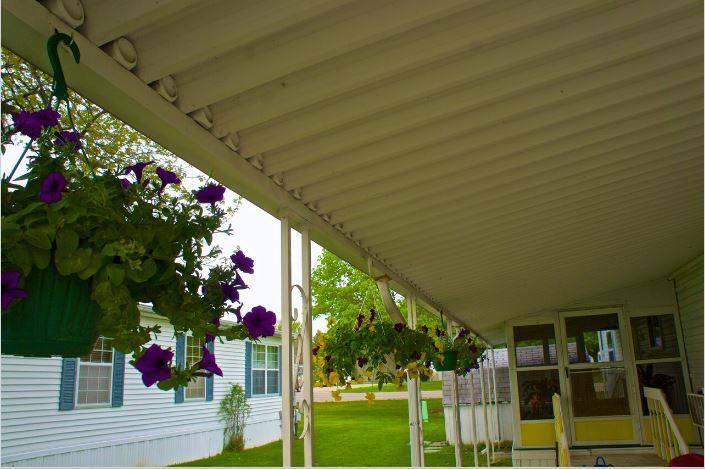 Luckily, people are quick to change their minds once they witness a successful mobile home remodel firsthand. There’s a reason debt-free living is catching on so quickly around the country. The benefits far outweigh the negatives. You may have a couple of friends that think you’re nuts, just like Kirk, but proving them wrong is kinda fun. 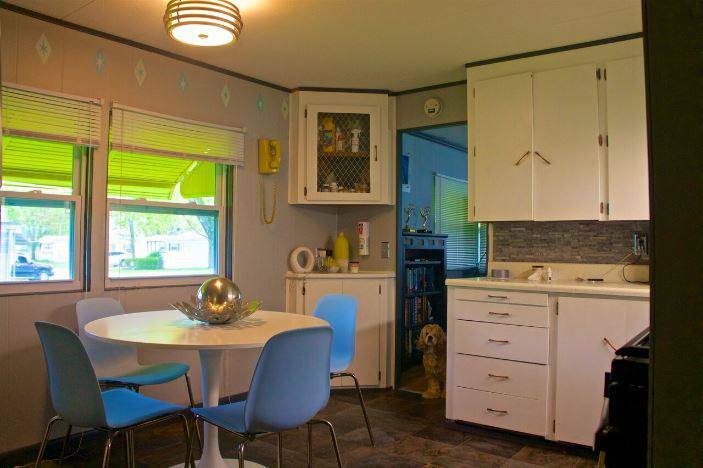 The extra money in your bank account is just an added bonus for choosing to remodel a vintage mobile home! 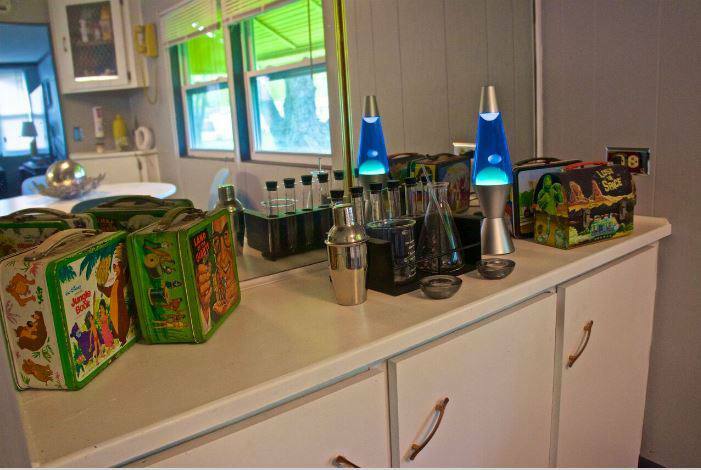 The following photos show the home’s condition when Kirk first purchased it. The paneling and windows were original. The home was in ‘good’ condition with decent bones. 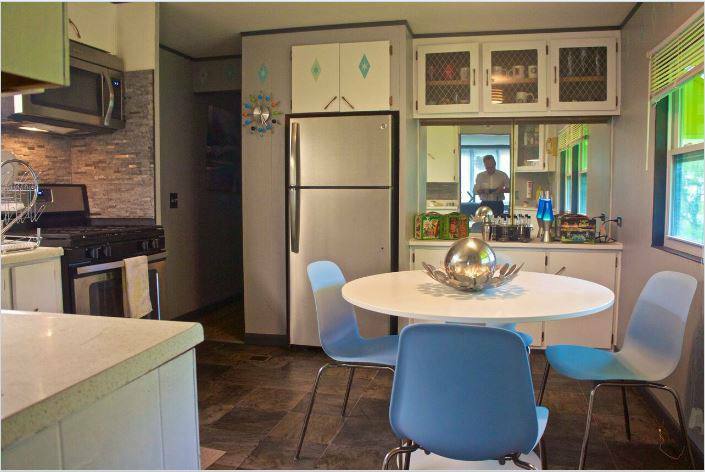 The finished kitchen in Kirk’s $500 1968 Landola mobile home is amazing! 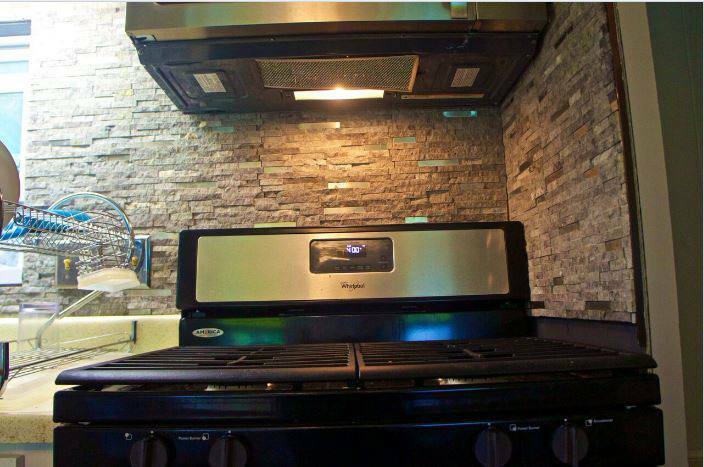 Muted greys were used on both the walls and the appliances and matched with a gorgeous natural stone backsplash. Retro diamond patterns in a contrasting baby blue adds a little pop to the space. It’s not too retro or modern – it’s a perfect balance of both. Kirk uses the built-in breakfast bar in the kitchen as a showcase for his collector lunchboxes and kitchen gadgets. 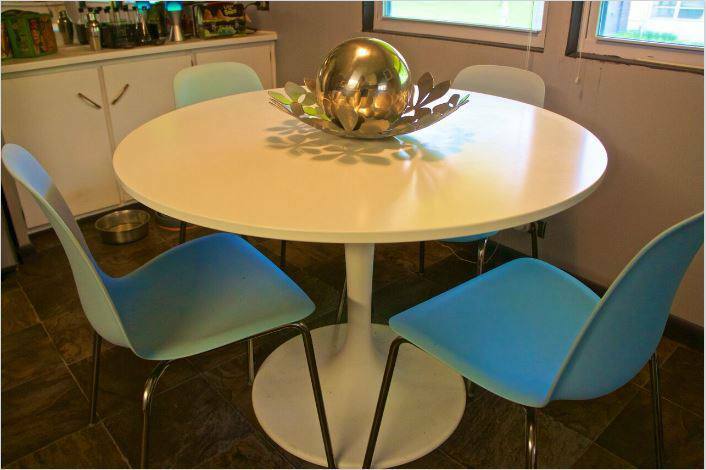 Using a round table in a small dining area is a great way to maximize space and create flow. With all the square elements in a kitchen, a round table catches the eye quickly. 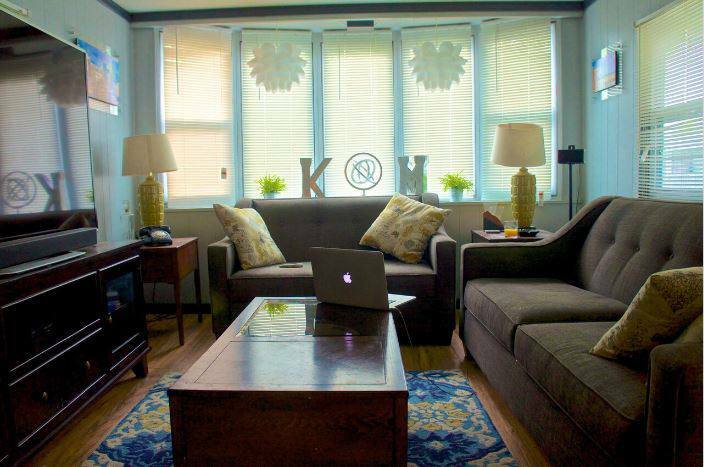 Kirk’s living room is beautiful! Ample light helps make the small room feel larger. Low furniture with clean lines help make the ceiling seem higher and creates balance. Light blue and grey with lots of white is a great color combination – light bounces throughout the room while the grey furniture creates weight to the space. The wall-mounted ventless fireplace acts as an accent wall and gives the room balance against the large television. 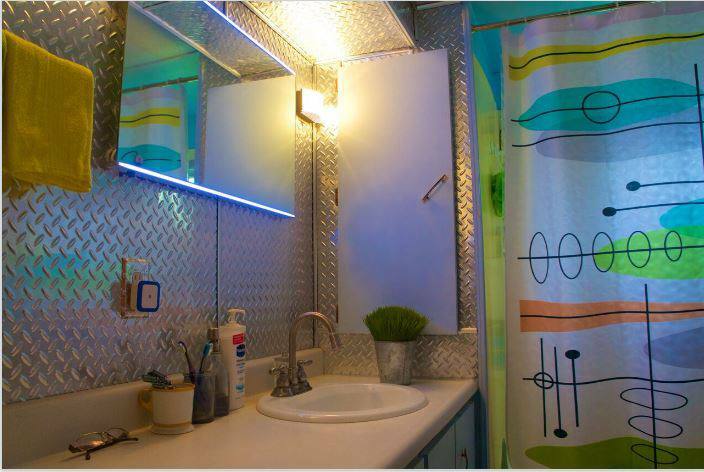 Using aluminum diamond plate metal panels over the bathroom walls is an ingenious and creative way to update a bathroom. We’ve seen sheet metal used in kitchens and bathrooms before but this is a first for the diamond plate. As long as the seams are sealed well the metal acts as water-proofing in the bathroom, a smart thing to have in vintage mobile homes. Sub-flooring is often made from OSB, a product that quickly swells and bows whenever a bit of water reaches it. This bathroom has a great retro/geek/tech style! 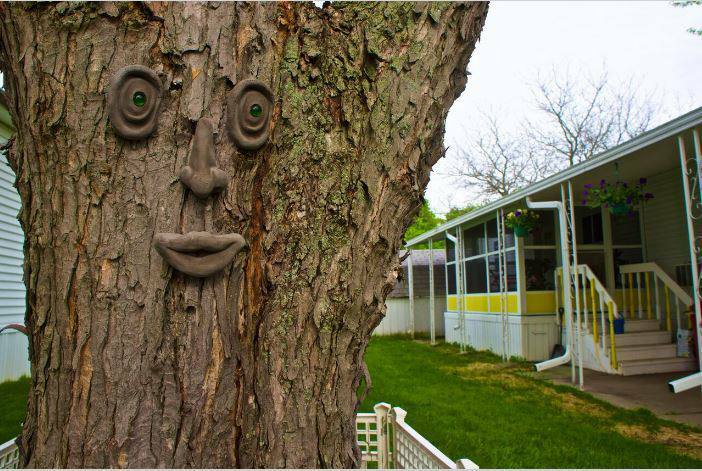 Kirk didn’t forget the exterior during his affordable mobile home remodel. The 1968 Landola single wide sits in a beautiful park! 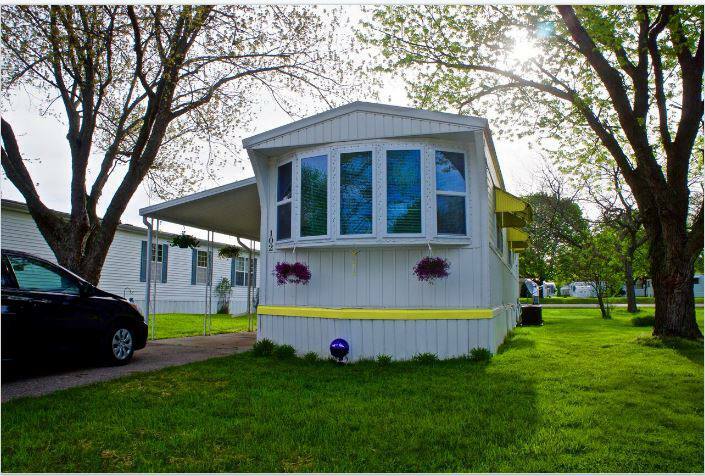 With the bright yellow trim, it won’t be hard to tell new visitors which home is yours, that’s always a plus in larger mobile home parks. Kirk spent approximately $10,000 on the home and the remodel thus far. That’s not a bad deal for the gorgeous home above! Future plans include insulating the plumbing better and replacing the bathtub and toilet. 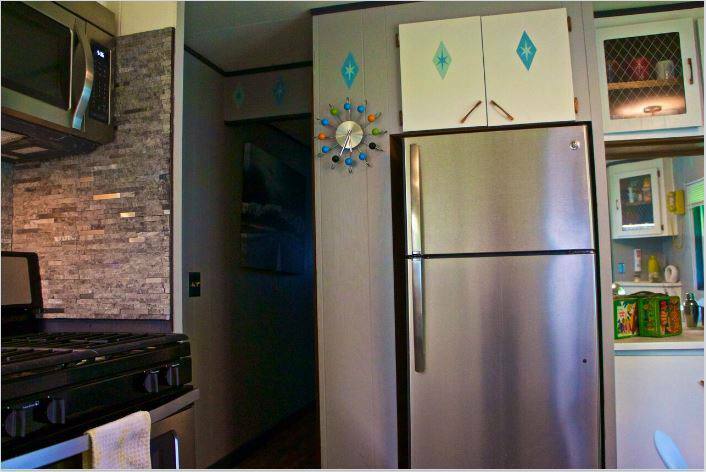 Being creative and resourceful is important when attempting to remodel a vintage mobile home. You will likely need to use material or products in a way the manufacturer did not intend. 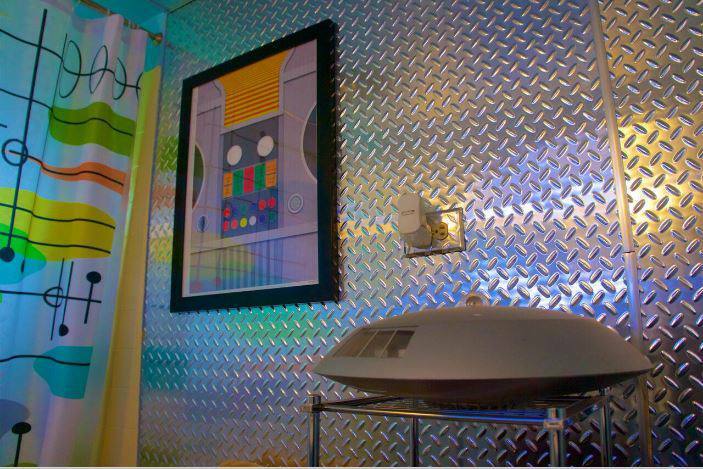 For example, Kirk used diamond metal panels on his bathroom walls. This added waterproofing to a room that is easily damaged by water. It also created a great conversation piece, all at an affordable price. Having the ability to see the potential that a vintage mobile home has is just as important as creativity and resourcefulness. Seeing a space and imagining what it can become and then envision the steps it will take to create that space is a handy talent to have when updating a 40-year-old mobile home. Imagination is always an asset! Lastly, having a good team helping you is a great resource to have when attempting an affordable mobile home remodel. Whether it’s just one person or ten, hired or free, every bit of help you can find will make your affordable mobile home remodel a success. Getting advice from fellow mobile homeowners that have completed an affordable mobile home remodel projects is a big goal here at MHL. Remodeling a vintage mobile home is intimidating so every tip we can get is appreciated. Any tips or tricks you learned during the project? I learn something new every day! I probably should have started with updating the plumbing pipes and electrical systems first, then went into the cosmetic stuff. I was anxious to move in and wanted it comfortable right away though! I think the kitchen turned out the best. It’s a great mix of retro styling with modern upgrades. I’ve only been doing this a few months so this is all a work in progress. The central air doesn’t seem to be working well so I need to check into that. Future projects will be replacing the skirting around the home, painting the exterior, and reinstalling all the awnings and shutters. Adding some nice landscaping, too. Favorite room in the home? Living Room is cozy, modern, and has lots of light! The advice you would give someone about buying and living in a mobile home? Well, honestly, if I had to do it again I may have waited for something in the $3000.00 range that didn’t need as much work. That way, I could have spent the rest of the money on cosmetic stuff. Thanks so much for letting us share your gorgeous home, Kirk! And thank you for reading Mobile and Manufactured Home Living! I have never accepted dealer or builder advertising on this site. I did trademark Mobile Home Living but I did that was for simplicity’s sake. The name of the blog was way too long! Sorry, you feel that way. What is the size of his mobile home? We live in a 12×60 1971 Schult, I love living debt free but we still have some things to take care of … so I love looking at what others have done to their older mobile homes. What an incredible transformation! Really appreciated the attention to detail on the design. Thank you so much Gary ! Beautiful job. Can you elaborate on what you used on the exterior. It looks brand new! So much fun! My husband and I may be moving into his grandfather’s small double wide with our two kids. It would be free and we could really pay down some student loan debt this way…but it’s a mobile home…I have been a little hesitant b/c I’ve never really liked mobile homes, but now that I’m seeing some really great ideas on how to remodel or even small budget “dress ups” I am getting a lot of inspiration and great ideas. I’m seeing a lot of potential. Thank you! Thank you ! Have Fun ! Hello, Crystal! I’m planning a remodel of a 1959 Spartan 10 x 45 MH..some of the repairs that have to be done, roof, window stripping/gaskets, and plumbing..I’m needing to correct with the best materials and procedures possible as they involve water and leaking possibilities. Can you less me to the right person? I’m a single Mom, needing a simple life. Thank you! I’m jealous! I want a Spartan so bad!! Please send pics to [email protected]! I’d love to see it! Thank you Sue! Good luck and most important have fun! Inspiring! I just walked through a $425K home yesterday (a friend is the Realtor selling the home). Your trailer certainly has more character! Dream on! Thank you so much – I’ve never done anything like this before it was trial and error but lots of fun! Sorry, my finger got away from me, and I posted too soon. 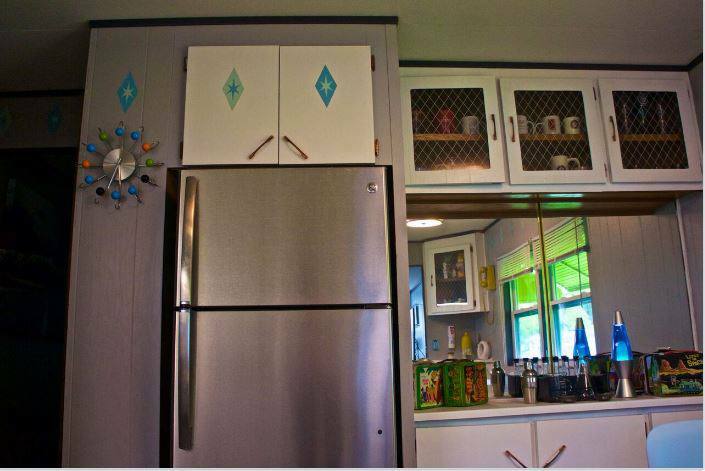 If the cabinets are original, what type paint did you use? Did you seal it with anything? Your remodel is impressive. I love the retro vibe. Did you keep the existing cabinets or replace them? Wow! Kirk Montgomery, this is so beautiful, thanks for sharing. What an amazing home! I love the kitchen…it’s beautiful! And the vintage (haha, from my childhood) telephone in the living room is absolutely perfect!